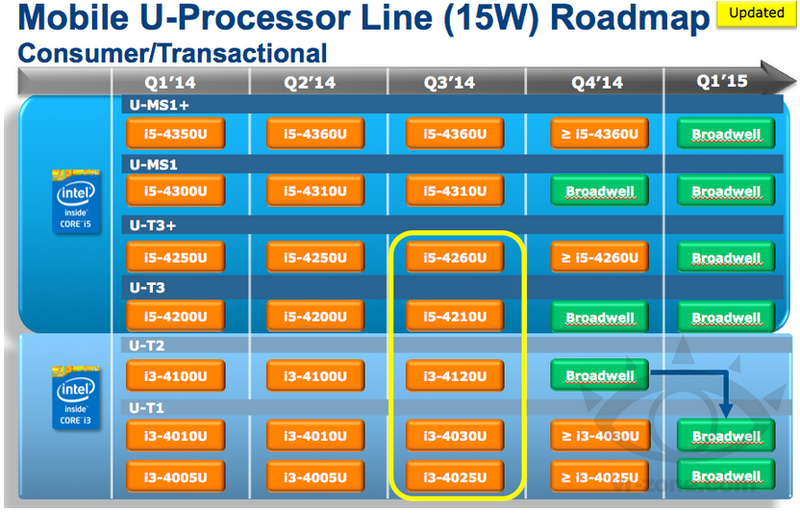 You must have seen a lot of tech sites claiming that the entire of Broadwell 14nm has been delayed to Q4 2014. Well that is about 50 – 75% correct. I have just received word that though the main portion of Broadwell is currently on track the ‘Y’ ‘U’ and ‘H’ Variants have been delayed. As you may know Broadwell will be the first 14nm Fab used by Intel. It will utilize HT and Turbo Boost 2.0. The instructions supported will be AES, AVX2 and TSX with the x86 instruction set (x86-64). The H processors will have 6mb of L3 Cache and some of the SKUs will have the GT3e graphics with eDRAM (an extra cache memory). This will be implemented as a separate die on the chip itself. The ‘M’ series will be arriving as per schedule as will the desktop variants. Basically what was only a delay in select mobile processors was inaccurately portrayed to mean the entirety of the Broadwell series. Anyway, moving on to the the actual leak. Apple Macbook Air Could suffer due to delay of ULV Processors. The Z97 Chipset will launch on May 11 2014. In the second and third quarter Core i7-4860HQ, Core i7-4760HQ, Core i7-4712HQ and Core i7-4710HQ will launch. “M” Series to release in April and will include the Core i7-4940MX, Core i7-4910MQ, Core i7-4810MQ, Core i7-4610M, Core i5-4340M, Core i5-4310M, followed by the third quarter is the Core i7 -4712MQ, Core i7-4710MQ, i5-4210M, Core i3-4110M and Core i3-4100M. Pentium and Celeron 3560M and 2970M to launch in Q3. Haswell Refresh “Y” Series Core i5-5220Y and Core i3-4030Y to arrive in Q3.